This makes it a lovely setting for a picnic along the banks of the River Seine where you can get to see moored houseboats and the river cruise boats going up and down, but there is also a small childrens playground, public toilets, and an area for roller skating. However, there is also the Musee de la Sculpture en Plein Air, which basically translates to the museum of sculpture in the open air, where you can discover many different sculptures from famous artists such as Ossip Zadkine and Etienne Martin, with one of his Demeure sculpture series with another of his sculptures being located at the Parc de Bercy park within a pond. 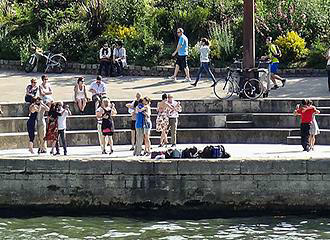 There is also a small amphitheatre area, or plaza, which is situated right by the waters edge at the Quai Saint Bernard opposite the Jardin des Plantes that has become a venue for a dancing festival held every summer. So it is here from May through to September that you will find couples performing folk, tango, salsa, etc and this tradition has been running several years, when the music and dancing starts at the weekends around 7pm to 7.30pm and finishes with the last performance at midnight. There is also a competition held in summer as well that finishes with a grand ball, plus there are sometimes the opportunity for people to get a free introductory class to a particular style of dancing. Parts of the garden are accessible to the disabled, but you can also gain access to the Jardin Tino Rossi Garden via a staircase located just in front of the Arab World Institute by the Pont de Sully end, which is the easiest way to get here. Located within the 5th Arrondissement only a short walk from the Michelin starred famous restaurant in Paris called La Tour d’Argent, this garden in Paris is open 24 hours a day, all year round with free access, which means you can also discover the open air sculpture museum completely free of charge as well. Getting to the Jardin Tino Rossi is straightforward with the public transport in Paris as you have the Metro station called the Quai de la Rappe on line 5, the Gare d’Austerlitz train station, which is also the RER train stop. 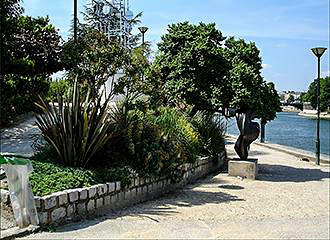 Plus there is the Batobus water bus and the buses numbered 24, 63, 67, 86 and 89 that will get you close to this garden. 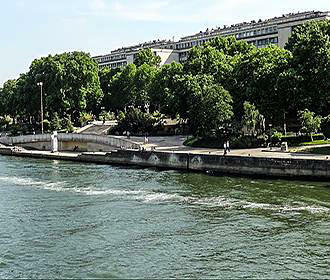 The Jardin Tino Rossi is a small garden in Paris that is located along the banks of the River Seine and is home to the Musee de la Sculpture en Plein Air, plus there is an open air dancing festival held at a small amphitheatre by the quay each year. The Jardin Tino Rossi is a small garden in Paris that stretches for approximately 600 metres along the banks of the River Seine between the Place Valhubert and the Pont d’Austerlitz bridge to the Pont de Sully bridge. Here you can enjoy shaded areas from the old plane trees, weeping willows and blossoming cherry trees to name a few, not forgetting the large Italian poplar tree at the entrance to garden, the beautiful magnolias and other flower plants.